Few music gatherings can offer adventure in addition to entertainment, but Jam Cruise is a different experience than any other music event out there. The 10th sailing of Jam Cruise will be January 9 – 14, 2012, leaving from Ft. Lauderdale, FL and traveling to Labadee, Haiti and Falmouth, Jamaica before turning homeward. 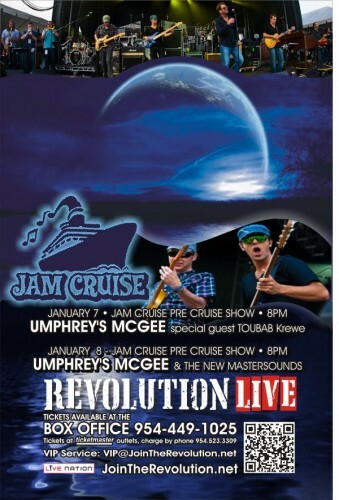 Jam Cruise sold out months ago, but you can get your boogie on with the Kickoff Party featuring Umphrey’s Mcgee, The New Mastersounds, and Toubab Krewe. We’re giving away tickets for each show.